Rhizosphaeara Needle Cast is one of the most common fungal diseases of Colorado Blue Spruce. This disease can also affect other conifers including Engelmann, Black Serbian, Sitka Spruce, Austrian, Mugo, White pine, Douglas fir, and Western Hemlock. Infected needles, including those that are still attached to branches, and those that have fallen to the ground, produce spores that can be blown or splashed to healthy branches or trees. The first noticeable sign of Rhizosphaera Needle Cast is a loss of the innermost needles on the lower branches of the tree. This usually starts to occur in the late fall, or the spring, one year after infection. The infection will gradually move upward and outward, leaving the tree with a hollow or barren appearance near the base of the tree. Often the youngest needles remain healthy. If Rhizosphaera Needle Cast is the problem, you should be able to see rows of small black dots erupting through the surface of the needle (you may need a magnifying glass to see them). 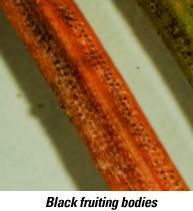 These black dots are fruiting bodies of the fungus that causes the disease. Colorado Blue Spruce is highly susceptible and can sustain severe damage. Sometimes young trees are killed by the pathogen, but more commonly branches lose their needles, resulting in misshapen trees. Two foliar sprays per year can drastically reduce infection, decrease damage, and improve tree health. Treatments need to be done for 2-3 years in order to gain control over the disease.